1978 4 89.550 Malaguena * God Bless the Child * Main Theme (from Star Wars) * Ben's Theme (from Star Wars) * Princess Leia's Theme (from Star Wars) * The Last Battle (from Star Wars) * The Coronation (from Star Wars) * How Deep is Your Love? 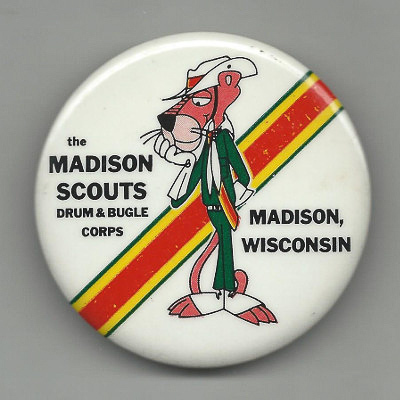 The Madison Scouts Drum and Bugle Corps is a World Class competitive junior drum and bugle corps based in Madison, Wisconsin. 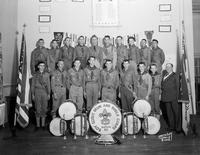 During its formative years, the Scouts performed in local concerts, parades, War Bond drives, and the like. They also attended the World Scout Jamboree. In 1951 the corps split into the Explorer Scouts and the Boy Scouts. The Explorers wore the dark green scout uniforms, while the Boy Scouts wore the corps' old uniforms of khaki scout shirts and shorts. 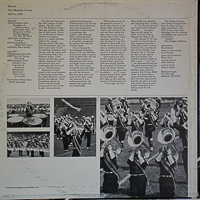 The drum corps first entered national competition in 1954 and, in their first "national" competition, placed second at VFW Nationals in Philadelphia. 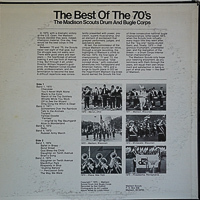 Even then, they were crowd favorites with their unique form of drill, head choppers, horn and cymbal spins, dance, and other elements which remain a part of the corps' repertoire in the 21st Century. The Scouts repeated as VFW runnersup in Boston in 1959. In 1956, thwe corps went, instead to te American Legion Nationals in Los Angeles... and finished second. They returned to VFW Nationals in 1957 and were Finalists thru 1962, while also being Legion Finalists in '58 and '59. 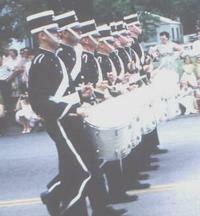 In the early 1960s the corps switched from Explorer Scout uniforms to West Point cadet style uniforms. 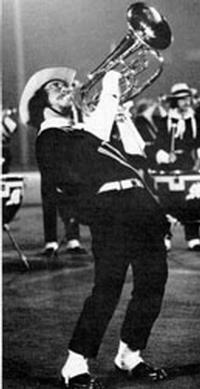 Although the corps attended VFW Nationals every year from 1964 through '69, they made a finals appearance only with a 10th place tie in 1966. In 1969, under a new director, DCI Hall of Fame member Bill Howard, the Scouts reverted to the scout uniform, made immediate improvements, and returned to VFW finals in 1970 and '71. 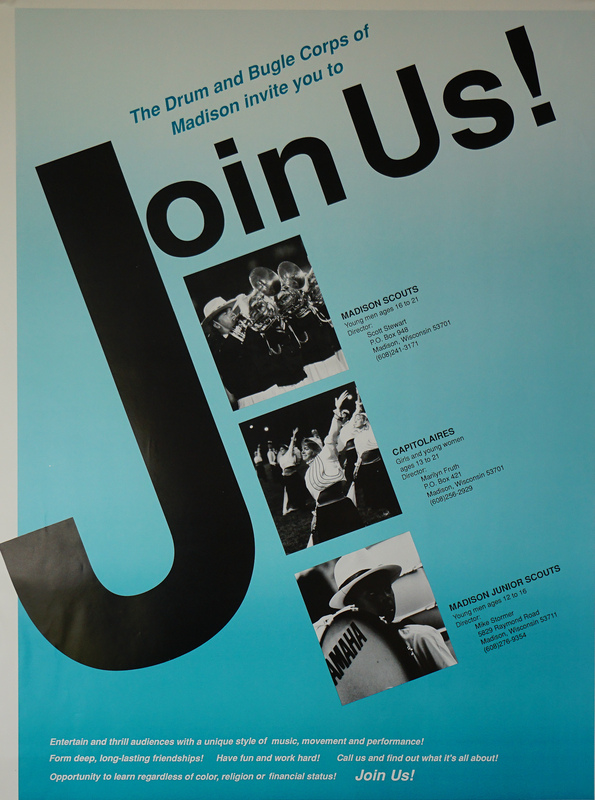 Madison's 1971 program was a controversial groundbreaker. "Scouts in Fantasyland" featured the White Rabbit, Pinocchio, the Seven Dwarfs, and Bonnie Howard (the only girl ever to be in a Scouts field show) as Alice in Wonderland. The show was very well executed and heartily enjoyed by audiences. However, the VFW dictated that there could be no dancing, skipping, clowning, costumes, et cetera, and the Scouts had to put on their show at Nationals “straight.” With their "show" restricted to only marching and maneuvering, they suffered for it and only managed to place tenth. 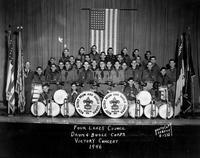 Before the VFW dictated the creativity out of their 1971 performance, the Scouts had been urged by Cavaliers founder Don Warren and Troopers founder Jim Jones to join in starting a new organization run by the drum corps and free from the rigid, inflexible rules of the American Legion and VFW. 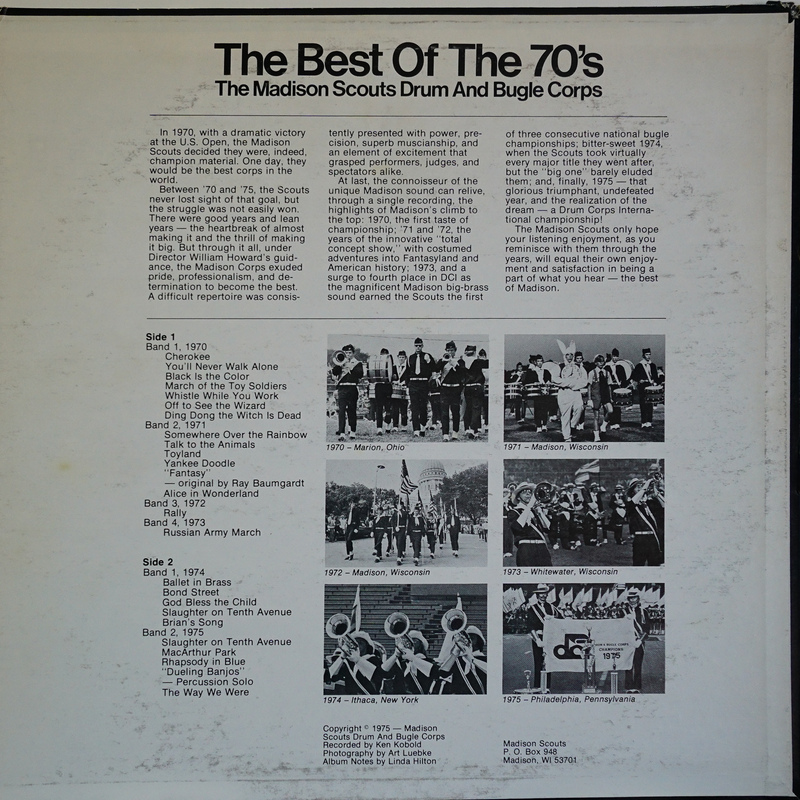 During that '71 season, the "Midwest Combine," composed of the Blue Stars, Cavaliers, Madison Scouts, Santa Clara Vanguard, and the Troopers were not only booked into a number of shows together, but they found a host for a show of their own, which was a spectacular success. A simiar groupcalled the United Organization of Junior Corps (also known as the "Alliance") was made up of five Eastern corps. 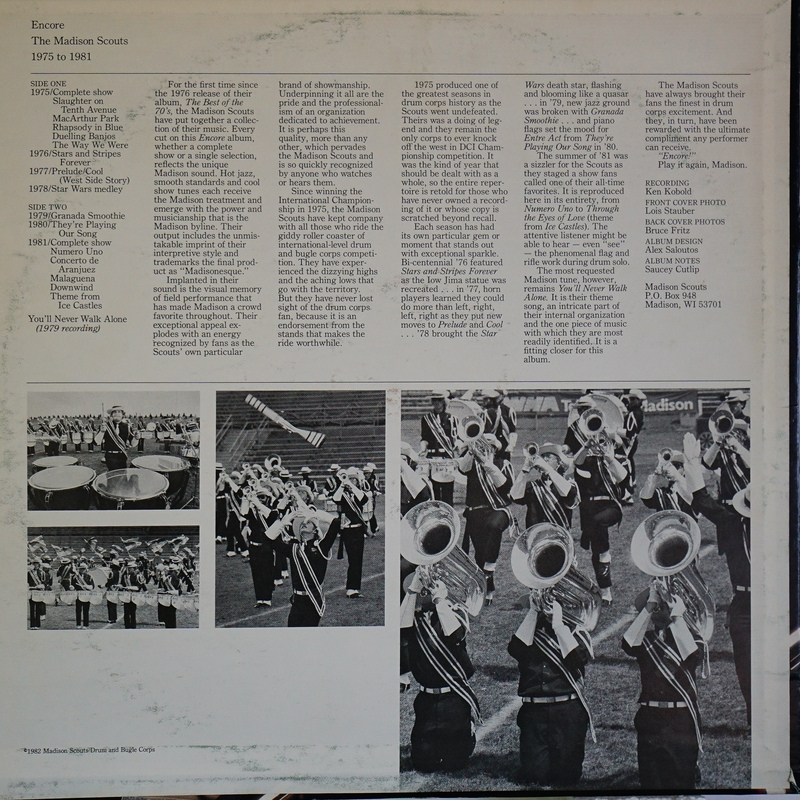 In 1972, the corps from the Combine and the Alliance joined with three other top corps to form Drum Corps International (DCI). 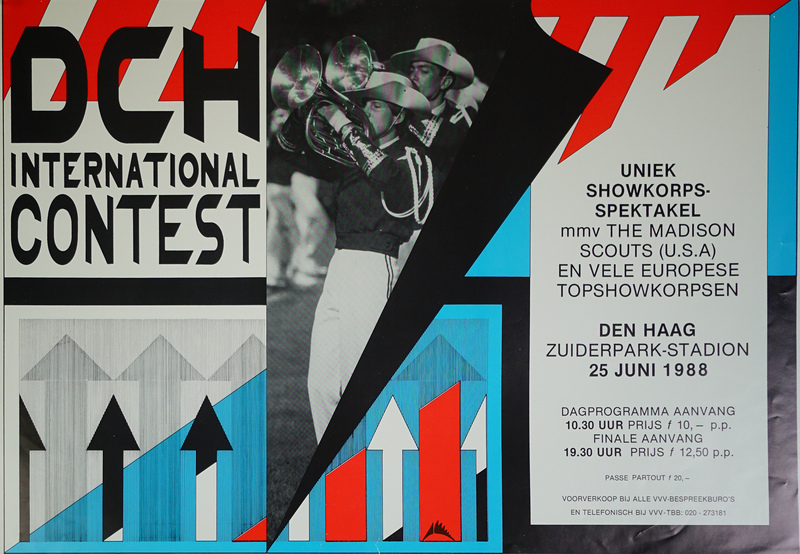 The Scouts returned to Finals in 1973 in a big way, offering the musical style fans still enjoy today. At CYO Nationals, on August 8, 1973, the corps, ablaze with competitive fire, roared through their show 37 seconds faster than they had ever done it before. Although some members passed out from the exertion, this may mark the beginning of Madison's special crowd-pleasing style. They won the brass trophy that year and for the next two years as well. 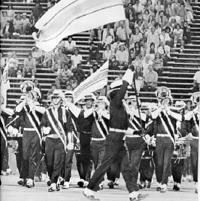 In 1975 the Scouts were undefeated and became the first non-California corps to win the newly established DCI Championships; this they did with the first winning score higher than 90 points (92.5) in DCI's young history. The Scouts toured Canada, the Midwest and East, and the Southern U.S. in 1980, with a powerful show that had the crowd screaming for more. 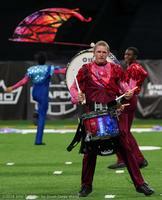 The corps captured several major show championships and placed sixth at Birmingham in a hotly contested DCI Championship in which only 3.55 points separated the top six corps. But in Chicago, the Scouts were finally able to win a VFW National title, in a tie with The Cavaliers. (At VFW Finals, the Scouts were joined by three young ladies who formed the "American party" color guard as "guest performers'--- like Bonnie Howard in 1971, they were not considered to be corps members.) 1980 was also the year for the development of a complete alumni staff. Bill Howard stepped down as Executive Director and was replaced by Scott Stewart. 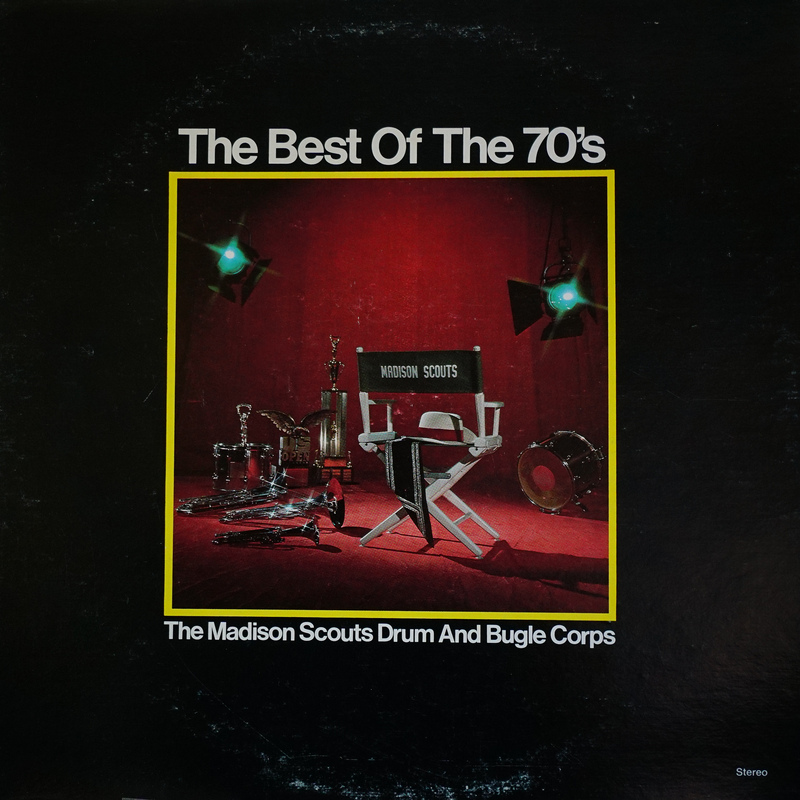 The corps continued to strengthen itself financially in 1982 by establishing a booster club and by making the Madison Scouts Foundation, which had been established several years earlier, a productive undertaking. The Alumni Association was also revitalized. 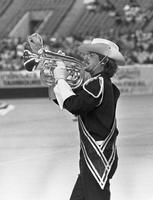 In 1982 the Corps placed fifth at the DCI Championships with a show consisting of "Slaughter on 10th Avenue," "Strawberry Soup," and "Ice Castles." The corps completed its conversion of bugles to silver-plated, two-valved instruments and, after years of effort, finally established a successful bingo game. 1983 saw the continued development of an almost all-alumni staff, and the corps presented its most demanding program ever, consisting of "Colas Breugnon Overture," "Strawberry Soup," and selections from "Cats." Establishing a unique tradition, at the Championship finale Madison took the field with no equipment and sang "You'll Never Walk Alone" to the enchanted crowd. Membership in the corps reached an all-time high in terms of average age (20; only 12 members were under 18), and 34 aged out that year. The corps remained near the 128-person limit and continued to receive more applications each year from outside the Madison area than there were positions available. The corps made a major uniform change in 1983, adopting a more visually impactive look of white Eisenhower-style jacket, green pants, mint green shirt, white Aussie hat, white shoes and gloves, and red citation cords, gauntlets, tie, and hat band. New percussion equipment and a semi-trailer equipment van were also purchased. The Madison Scouts held its position in the magic "top five" in 1984. Only 3.4 points separated these groups at the World Championship in Atlanta. Financially, the Madison Scouts was a phenomenon in the drum corps world by eliminating all debt and operating with a positive cash flow. 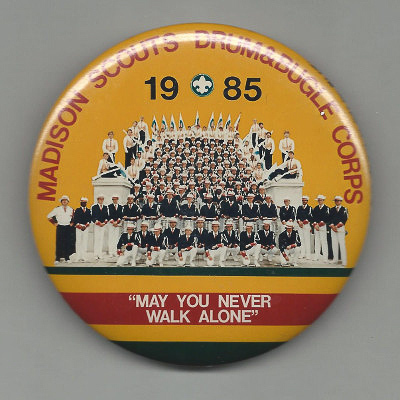 1985 was a banner year in the history of the Madison Scouts when the corps finally received long-deserved attention in the City of Madison. Much of this was due to the World Championships being held at Camp Randall Stadium, the most successful in DCI history, with over 100,000 people attending. 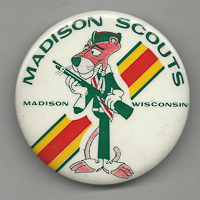 Much credit was due to the local Madison Scouts committee. The corps also appeared with the Wisconsin Chamber Orchestra and at the Badger State Games as well as continuing to appear at the annual spring Open House, Dress Rehearsal, and several concerts throughout the city. 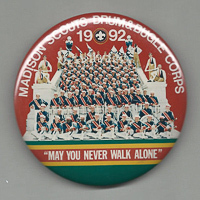 Individual members of the Scouts performed with locally prominent arts groups such as the Kanopy Dance Company and the Madison Symphony Orchestra. The '85 show, based on George Gershwin's "Rhapsody in Blue," continued the Madison success in combining entertainment and artistry, and was rewarded when the corps was named the most popular corps in a nationwide DCI fan poll. 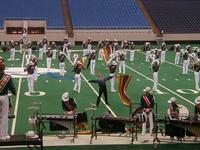 This was also the year that the Scouts’ percussion ensemble set a DCI record with a perfect score of 100. Other notable accomplishments included the reversing of the uniform scheme (white jackets/green pants to green jackets/white pants) and brightening the accessories, as well as the beginning of a mutually beneficial relationship with the Yamaha Musical Corporation, which included a new state-of-the-art set of percussion equipment. The corps took another step toward financial security by establishing an equipment reserve for future capital equipment needs. 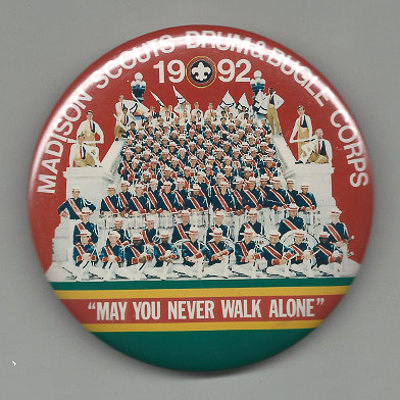 1986 saw the launch of a major capital fund drive to raise money for the purchase of three new/used coaches for the corps, as well as the return of the DCI Championships to Madison. 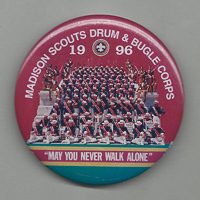 The Green Bay Packers played their first game ever at Camp Randall Stadium in 1987, and the Madison Scouts were the featured half-time entertainment. Interns from Japan and Britain toured and studied with the corps during the summer months. In 1987 the Madison Scouts completed their capital fund drive, raising over $180,000 for the purchase of replacement coaches for the senior corps. These vehicles gave Madison the distinction of owning some of the newest buses in the entire activity. In addition, a new staff vehicle replaced the retired "Batmobile." The DCI World Championships returned to Madison for an unprecedented third year due to the successes of the first two years. 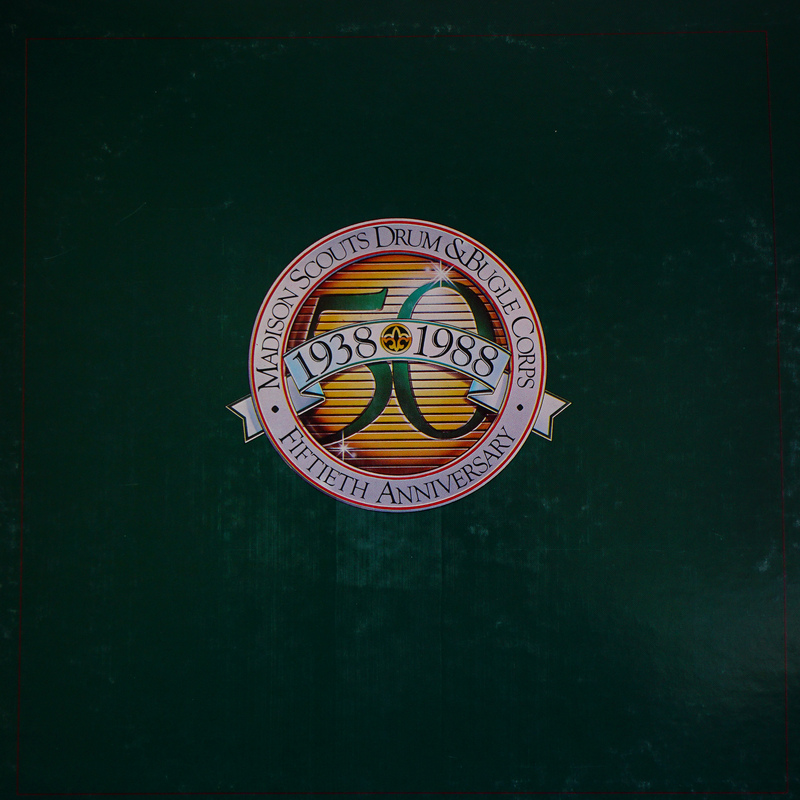 1988 and the celebration of the Madison Scouts' Fiftieth Anniversary made for one of the corps' greatest years. Festivities included an alumni reunion, special promotional items, and the return of the Drums on Parade contest to Madison. 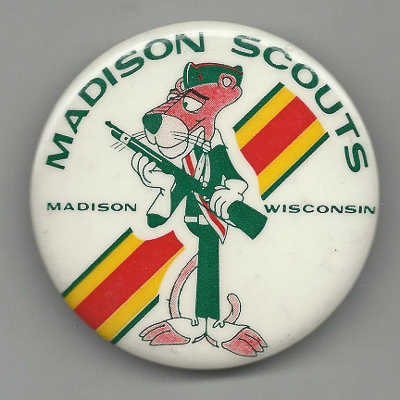 Following an undefeated short first tour of Wisconsin and Illinois, the Scouts flew to Europe. The corps toured Germany, Holland, and England in June where they conducted clinics, hosted competitions featuring every active European corps, and performed for the marching-music community in Europe. Returming to the U.S., the second tour took the corps throughout the Midwest, South, and Southwest en route to Kansas City for the DCI Championships. There the corps capped off its anniversary year by winning the Scouts' second DCI World Championship with one of the finest, crowd-pleasing performances in the history of the activity. Their program was based around "Concerto for Guitar and Jazz Orchestra" and "Malaguena." 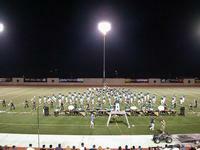 In the DCI Individual and Ensemble contests, five ensembles and individuals won titles. 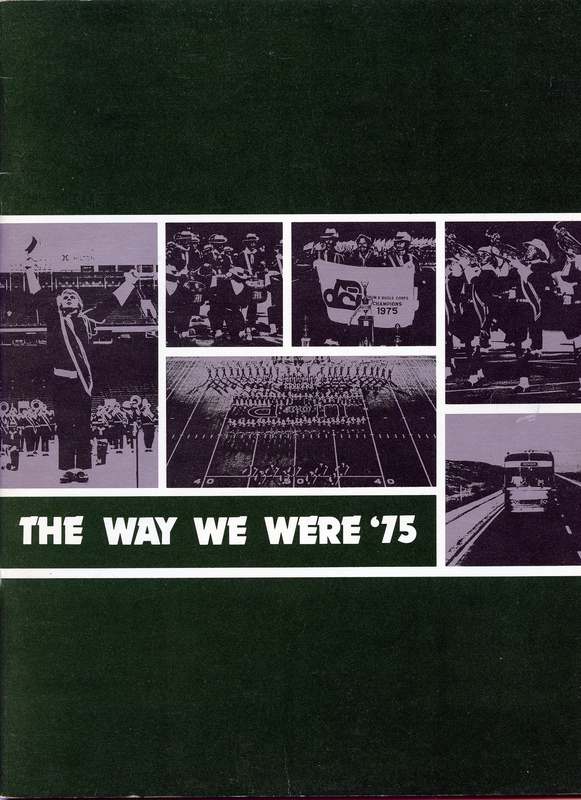 Finally, the corps also produced a 90-minute 50th anniversary album and cassette which traced the musical development of the Madison Scouts from 1954 to 1986, and they printed a yearbook for the first time since 1975. The corps continued to have the highest retention rate of eligible members in DCI, with veterans comprising two thirds of their strength. As a fresh approach to fund-raising, the newly-acquired buses were leased to the Star of Indiana Charter Bus Company during the off season. 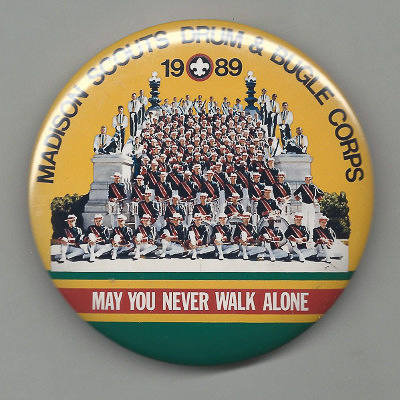 The Madison Scouts family and the drum corps community responded to the needs of Robert French and Fred Bell in 1989, two former members of the Madison Scouts who had been severely injured in accidents. Scott Stewart was unanimously elected to his ninth consecutive term as president of Drum Corps Midwest and continued in his tenth year as a member of the Executive Board of Drum Corps International. At the annual banquet, Mike Stormer was honored for his 13 years of unselfish commitment as he stepped down as director of the Junior Scouts. 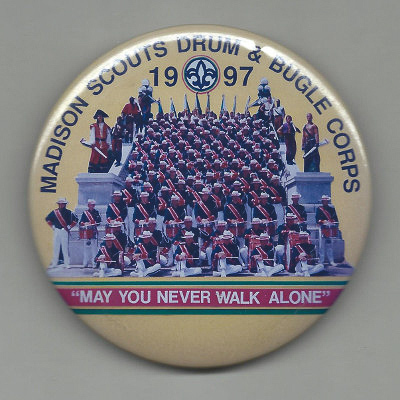 In 1990 the Madison Scouts put on more land miles and toured longer than they ever had before. All of this was accomplished smoothly and with virtually no rolling stock breakdowns, a positive indication of how far the corps had advanced in the last decade. The corps purchased a new cook vehicle to go with the promotions vehicle acquired the year before. On the financial side, the corps maintained a healthy profile, and the alumni project started generating some real financial support for the organization. 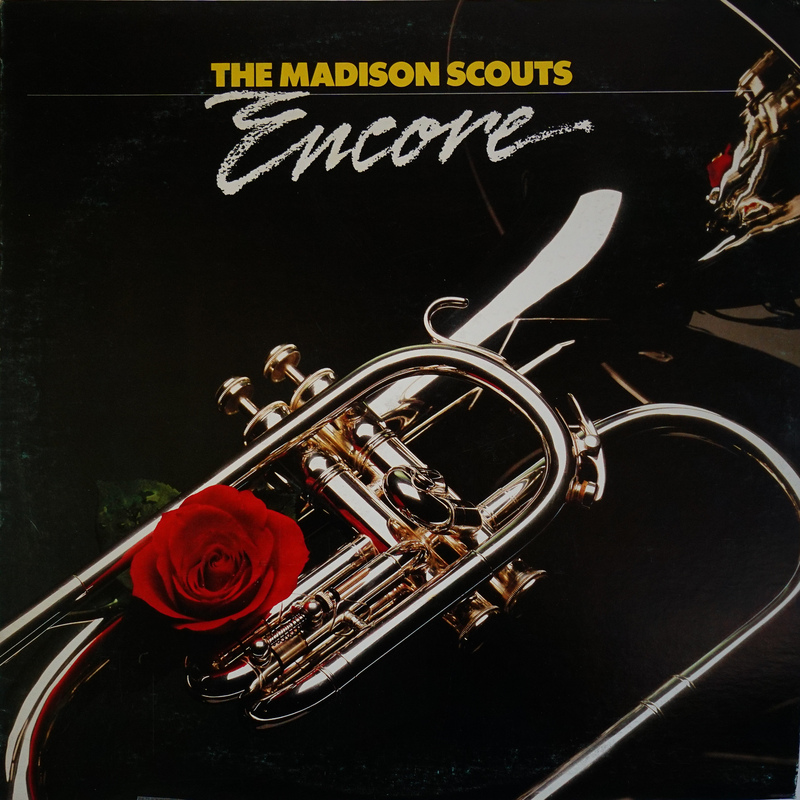 The corporate name dropped the word "Scouts" and became the Madison Drum and Bugle Corps Association, Inc., and the charter for Troop 600 was in its last year. The corps began its conversion to three-valved bugles in 1991, which had been approved a year earlier. Barb Loeffelholz and Pat Omilianowski were chosen by DCI as volunteers of the year. In DCM, it was noted that seven of the directors of the top 23 corps were alumni of the Madison Scouts and that many ex-members were teaching and managing throughout in the activity. The corps continued to attract applicants from throughout the United States and from a number of foreign countries. 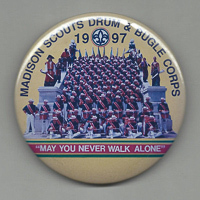 Thirteen citizens of Japan, England, the Netherlands, and Canada were members of the Madison Scouts in 1992. The 55th anniversary of the Madison Scouts was celebrated in 1993 by presenting an exciting, well-executed, crowd-pleasing program while providing another special experience for those involved with the organization. Titled 'Reflection and Evolution,' the show was based on "Numero Uno," "Strawberry Soup," and "Encore," an original composition by staff members Scott Boerma and Taras Nahirniak. 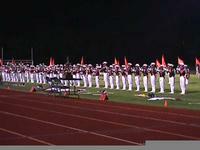 The corps performed over 60 times while touring throughout the Midwest, Colorado, Texas, and Louisiana. The Championships were held in Jackson, Mississippi, and Madison performed brilliantly, during a driving rainstorm that enabled the corps to claim the dubious distinction of being the only corps ever to be rained on during a DCI Finals performance. 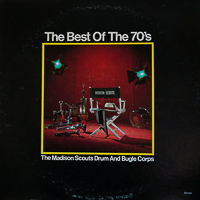 The corps produced a two-volume compact disc, 'Through the Years,' which traced the musical history of the Scouts from the early fifties through 1992. Scott Stewart was inducted into the DCI Hall of Fame. 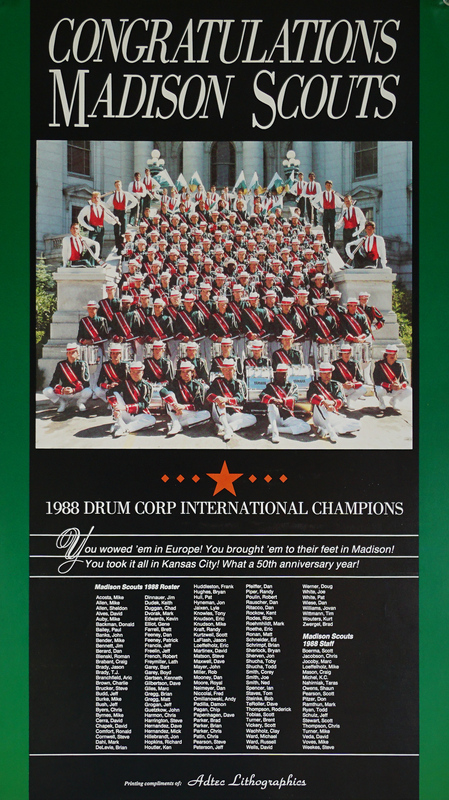 The corps’ 1994 Latin-jazz based program consisting of "Santos," "Cuban Overture," and "Malaga" elicited standing ovations at every stop along the tour. A record year in souvenir sales and two post-season "Drum Corps World" polls rating the Scouts as audience favorites and having the best musical book confirmed their popularity. The color guard projected a new, more powerful image, and the corps enjoyed the convenience of their newly-constructed equipment trailer. The twelfth annual spring Open House in Madison welcomed the Naval Academy Drum and Bugle Crops. 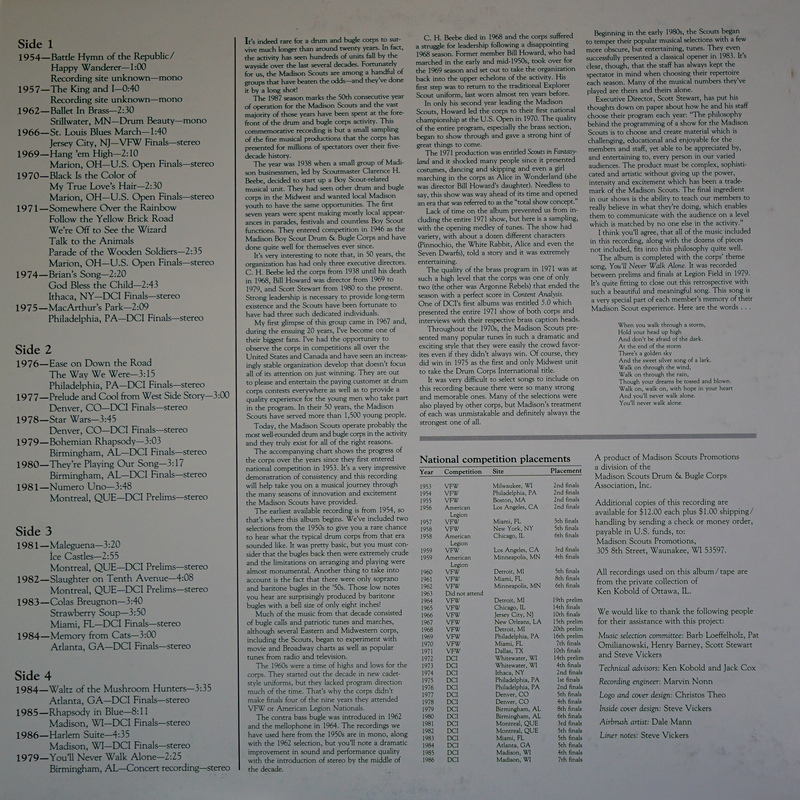 As well, 'Drums On Parade' continued at Camp Randall Stadium and was publicized in an eight-page insert in a Madison newspaper delivered to over 170,000 Sunday subscribers. Bill Howard was inducted into the DCI Hall of Fame and board member Steve Vickers into the DCA Hall of Fame. 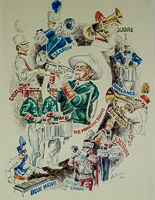 The corps featured a completely Spanish-flavored program in 1995. Subtitled 'A Drum Corps Fan's Dream,' the show featured a matador-garbed guard, an authentic flamenco dance, a dazzling full-corps revolving front, and an array of other effects. A record number of post-season letters, phone calls, Internet transmissions, postseason polls, and souvenir sales confirmed the success of the season. It was becoming clearer that, while the Scouts continued to thrive, the Junior Scouts and Capitalaires programs were stagnating, not adequately serving local young people. After brainstorming and planning, the Madison Junior Scouts and the CapitolAires were merged into a new coed corps, Capital Sound Drum and Bugle Corps. The new program had the intent of providing the same benefits for local youth that the Madison Scouts were offering for their world-wide pool of members. The Association's financial strength was enhanced by the acquisition of what had been the CapitolAires bingo game, and the Madison Drum and Bugle Corps Foundation continued to increase its assets so that the future of the Madison drum corps would be secure. DCI’s prospects seemed a bit brighter when Dan Acheson, a Madison Scouts alumnus, was named as the new Executive Director and Scott Stewart was elected Chairman of the Board. The 1996 Madison Scouts added fuel to the fire they had started in '95 and presented 'A Drum Corps Fan's Dream, Part Dos.' This production started where the previous year had ended and featured another Latin-jazz program based on "A Mis Abuelos," "Bolero," "En Fuego," and "Malaguena." The DCI Championships took place in Orlando, Florida, where the Scouts were featured in a special performance on the main stage at Epcot Center and received the Spirit of Disney award at the Saturday night finals, a presentation that cited the corps for being the most creative and entertaining group of the evening. The crowd's boos at the announcement of the corps's sixth-place finish were followed with an ovation so boisterous and persistent that the announcer was unable to continue. The 128 members of the Scouts had an average age of nearly 20.5, producing a record 41 age-outs at the end of the year. The corps continued to maintain the highest retention rate of eligible members in the activity at over 70 percent, and received more than 1000 inquiries from prospective members. In 1997 the Scouts presented a swashbuckling, nautically themed show entitled 'Pirates of Lake Mendota.' This blood ‘n' guts program featured a buccaneer-garbed guard, a well-developed story line, and original compositions by staff members Scott Boerma and Taras Nahirniak. 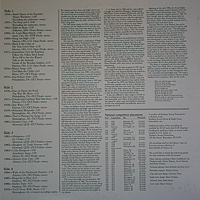 A new CD “Through the Years - Volume II” featured the Scouts' programs for 1992 through 1997. Souvenir sales, which seem to set a new record every year, grossed nearly $200,000. 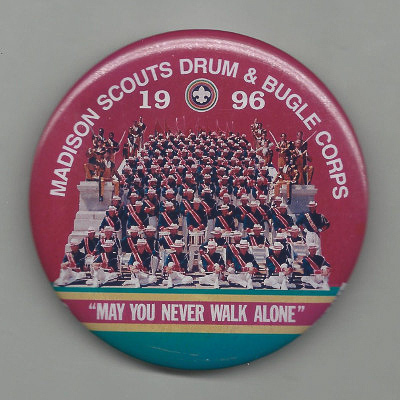 After Scouts staff members had been assisting Montgomery, Alabama's Southwind Drum and Bugle Corps in 1997, that corps asked the Madison organization to assume control. since they had little community support in Alabama. Moving the corps to Lexington, Kentucky during a year of reorganizing, the Madison organization now had three corps--- two in Division I and one in Division II. 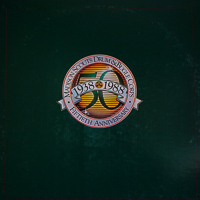 The corps’ 1998 production, dubbed 'Power, Pizzazz, and All That Jazz,' presented an all-jazz program that featured three very different approaches to the jazz idiom. The 1999 production was based on the music of 'Jesus Christ Superstar.' The Scouts presented fresh arrangements coupled with exciting visual interpretation of the feelings evoked by the music. They finished sixth in Finals competition in 1999. The Madison organization welcomed marchers from South Africa to the 2002 edition of the corps, sponsored by the Field Band Foundation. The Scouts suffered a disappointing 14th place finish at home in Camp Randall Stadium, marking only the second time in history that the corps had missed DCI Finals. Long-time corps director and DCI Hall of Famer Scott Stewart retired, and Sal Salas was named by Executive Director Bob Wall as director and program coordinator. As part of the reorganization, the Scouts cut their ties with both Southwind and Capitol Sound, leaving both corps to fend for themselves. The new leadership, accompanied by stylish new uniforms, brought the 2003 Scouts in at eighth place in DCI Finals, in their 65th year of operation. 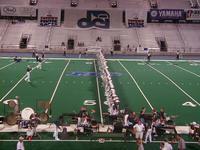 The Scouts' 2004 offering was called 'MadiSonic,' and it left the corps in eighth place in Finals for the second year. A full horn line rotating company front was becoming a Madison trademark. 2005's "The Carmen Project" moved the Scouts back to the upper half of the Top 12, with a 6th place finish. "Primal Forces" in 2006 finished in 9th place. Despite the four-year run in Finals, the corps was plagued by near-constant staff turnover, and in 2007 and again in 2009, the Scouts fell to a 15th place finish at DCI Finals, with a 12th place sandwiched between. In 2010, Jim Mason, former director of Star of Indiana, was hired as program coordinator/artistic director, and the Madison Scouts returned to DCI Finals under his guidance in 2010 through 2014. In 2014 Madison's director successfully petitioned the DCI Board of Directors to allow the use of any brass instrument on the field. The Scout's then featured a trombone quartet to some controversy. Scott Boerma, who had previously arranged Madison's music in the 80's-90's returned in 2015. It was not so much that Madison's quality had declined as it was that almost every other corps' quality and the daring originality of some had climbed to a higher plane, and in 2016, the Scouts once more found themselves out of Finals. In February of 2017, the Madison Drum and Bugle Corps became Forward Performing Arts Association, Inc. 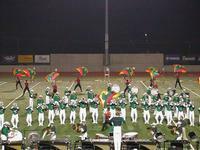 The Madison Scouts may have been belated in jumping on the the bandwagon for daring and original shows, but in 2017, they jumped on with both feet. "The Last Man Standing" was a shocking departure for drum corps traditionalists, but the tribal theme was fully in keeping with the corps' own traditions. 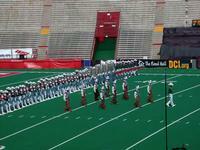 The show placed 12th in DCI Finals. 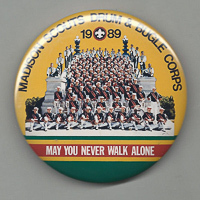 "You'll Never Walk Alone" has been the corps' theme song since it was first performed in a 1955 show. Alumnus Chuck Eikel remembers corps members spontaneously singing the song in response to a theme song challenge from a group of Cavies ("Somewhere Over the Rainbow") in 1957, and Scouts have been singing it ever since. Unique philosophies differentiate the Madison Scouts from other drum corps. The essence of the Scouts’ social philosophy is the simple belief in and observance of guidelines that benefit the entire global community through the actions of the individual. The more individuals who commit to these unselfish ideals, the healthier the environment becomes for everyone. The essential elements of this social philosophy are: always strive honestly for improvement; treat others in a kind and caring way; share your talents; approach every situation with a positive attitude; do the right thing, not just the easiest thing, in every situation; don't waste energy on situations beyond your control; actions speak louder than words; and avoid hypocrisy. The philosophy behind the Scouts’ show programming is to choose and create material that is challenging, educational and enjoyable for the members and staff, yet is approachable and entertaining to the audience. The product must be complex, sophisticated and artistic without giving up the power, intensity and excitement that has been a trademark of the Madison Scouts. The final ingredient in producing shows is to teach members to sincerely believe in what they're doing, enabling them to communicate with the audience on a level unmatched elsewhere in the activity. 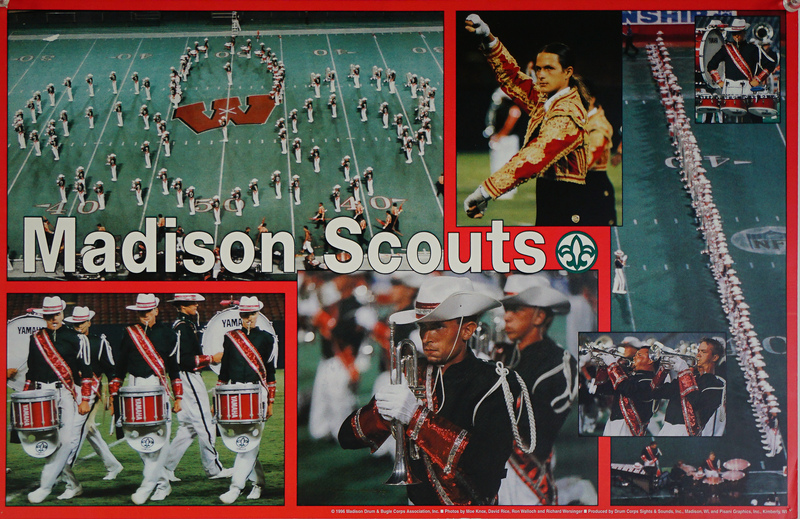 Throughout the years, the Madison Scouts have offered an exciting educational and developmental program. Every member has the opportunity to achieve personal and performance excellence in a unique fraternal experience, all while continuing an admirable tradition of consistently innovative, challenging and exciting programs that entertain and communicate with every person who views them.